The hospitality industry is notoriously fickle. It’s seasonal, so proper job security is a rarity. In addition, the instant the economy shows signs of a recession, people cut back on their spending on holidays and entertainment. The secret for hospitality managers is to recruit and retain talented employees who represent their brand effectively. 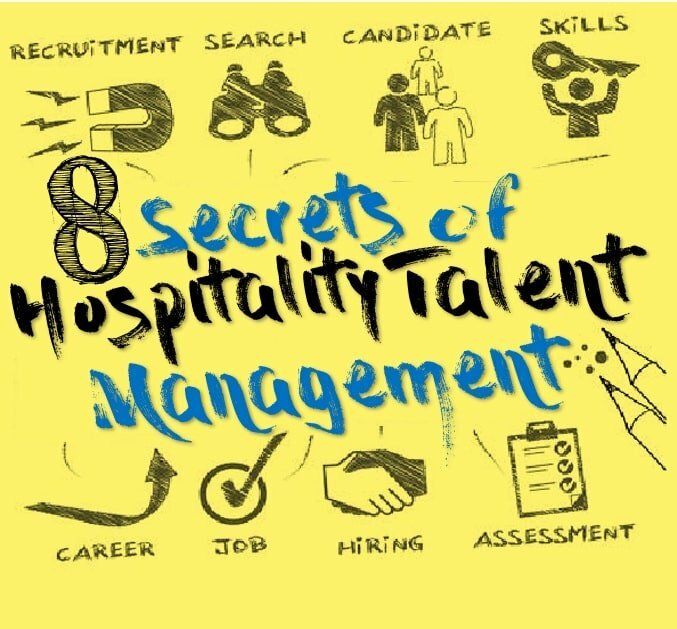 Here are some secrets hospitality managers should keep in mind when looking for talent. There are many jobs in the hospitality industry that can be conducted off-site, such as administering software, taking customer care calls, as well as bookkeeping and accounting roles. Managers no longer need to look for workers in the immediate geographic area of their business. In an agile workforce, contractors are those who do not necessarily have to live in the same country. Since employees may not be interested in permanent positions, contractors can be hired to help out over busy periods such as the summer. Hospitality managers should apply contract negotiation skills to set up mutually beneficial working arrangements. When looking to hire staff from the younger generation, hospitality managers should consider differing priorities. A lot of millennials don’t see work the way baby boomers do. As such, millennials do not necessarily work for one employer for an extended period and believe in job mobility. Flexible work hours also appeal to the younger generation. Generation Z commits themselves to a better work-life balance than their parents. When recruiting people to work in the hospitality industry, think of ways to make the job appeal to the millennials. If a hospitality manager is looking to hire freelancers to assist in a busy period, keep in mind that freelancers differ from regular employees. As per their choice, freelancers control their hours of employment and can move on to another job. A freelancer marches to the beat of a different drum. Freelancers thrive on their independence and being able to choose what they want to do. A good hospitality manager needs to be able to attract top-rated freelancers. Hospitality manager also needs to be able to manage the work the freelancer is meant to deliver. Hiring freelance or part-time workers can help a hospitality manager in a pinch. Make the rules and deliverables clear from the get-go. Be prepared to use negotiation skills from training to ensure you and your potential workers are on the same page. Being well-organized ensures that employees and freelancers are effective in their approach. Make sure they understand exactly what are your expectations. Let them know about the reporting managers. Set deadlines and feedback sessions and adhere to the schedule. Employees appreciate it when they know what has to be done, how, by when, and for whom. Contacting freelancers to fill the gap when things are busy costs less in the long run. When the hospitality manager contracts to hire staff on a full-time basis, the employer has to continue paying workers even if there is no willingness to perform. Otherwise, resorting to layoffs can be a complicated process. With contractors, a hospitality manager can keep the number of permanent employees down to a minimum. When business is slow, the freelancers aren’t needed. The manager must provide all the necessary information considering moving on to other assignments. Freelancing has been around for a very long time. Gaining popularity in the last decade, more people are now turning to it as their preferred method of work. Looking at the increase in freelancers, it’s clear that a vast sector of the workforce will be freelance in the years to come. Talented freelancers know the right negotiation approach to employ to get a contract with a potential employer. Freelancing is a learning curve. People who freelance and do the job well get a good reputation and enjoy their pick of assignments. Contracts protect both the hospitality manager and the freelancer. However, your contract shouldn’t be too complicated. Contracts should only detail how many hours of work are expected, what activities need to be done, and deadlines to meet. More importantly, your contract needs to specify the rate of payment as well as when and how payments will be made. A hospitality manager shared with us after graduating from one of contract negotiation courses in New York that she is now very careful to avoid overpaying or paying too soon and not on completing the work. If a hospitality manager needs a specific task completed and is looking for a talented contractor to do the job, the hospitality manager has a pool of talent to explore. There are many ways to find freelancers. Several internet platforms and social media apps allow people to connect. The other advantage of seeking on-demand talent is known to be an ‘audition’ for the hospitality manager. If the hospitality manager likes the work of a contractor, the hospitality manager can offer an extended contract and make the most of the freelancer’s abilities. The hospitality industry requires a great deal of flexibility from the managers who work in it. Hiring and managing talent is a risky operation because there are so many variables. The risk of things not going according to a plan is real. However, managers can make sure that they use these 8 simple secrets to hire the right people. Then, regardless of what circumstance throws at them, employers will know they have the right staff for the job. Authorities in training clients to successfully navigate their high stakes negotiations, negotiations.com also offer readers free online resources in the form of posts, book reviews, negotiation case, Q&A’s, and negotiation definitions.